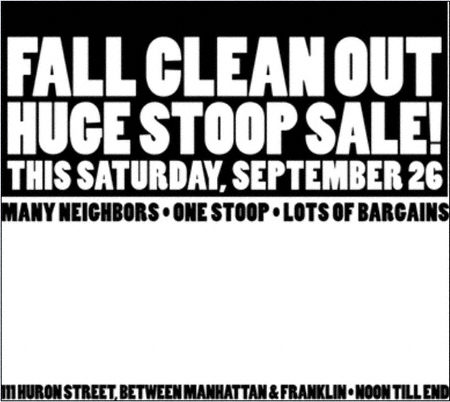 Anyway, thought I would drop you a line to let you know that my neighbors and I are banding together to create a stoop sale this Saturday, the 26th, at 111 Huron Street (between Franklin and Manhattan).Â Items up for grabs include men’s and women’s clothing, bags, books, a television, CDs, and other surprises.Â We’ll be kicking things off at noon.Â Between this and the other stoop sales that will be taking place for the Kent Street Festival, it should be a good weekend for bargain hunters in Greenpoint. I’ve attached a copy of our flyer in case you should feel moved to post something on your blog. Thanks for the kind words, Adam. They are greatly appreciated. I look forward to seeing what “surprises” you and yours have in store for us tomorrow!